Are you thinking to give your children a surprise on their special day? If yes, check out our exclusively designed cake for children- a pristine white cake with pandas. Seeing this white cake with a few dancing pandas on it will surely make them smile. 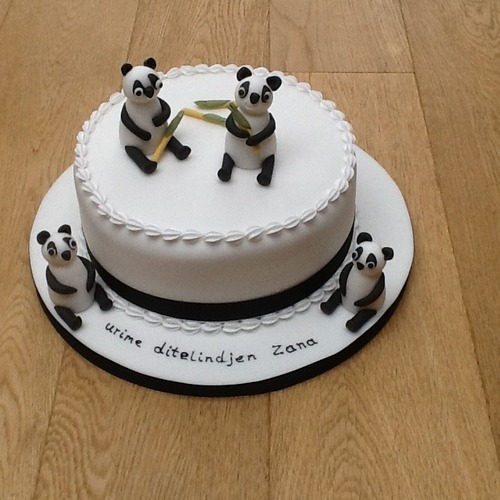 This pineapple flavoured cake in white colour with dancing pandas over the top will make the day even more memorable for you as well as for your kids. The cute and attractive design and a delectable taste of this exclusive cake will make the kids dance with joy on their special day. This delicious fun treat is the perfect gift for kids on any special occasion be it their birthday, their result day, the first day of new school or just to make them feel special. Give your little ones a pleasing and fun surprise with Giftjaipur’s exclusive Panda cake treat and express your love and affection in a fun and tasty way. You can customize the cake by increasing/decreasing weight and size of cake as per your need.